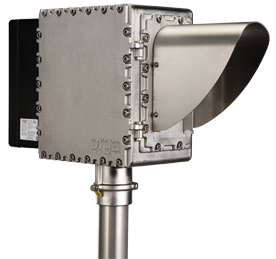 Orga offers the VDX05EX explosion proof fog detector/visibility meter which is designed to activate integrated systems that automatically check our marking systems and others. The explosion proof fog detector is made of a strong stainless steel construction, which making it extremely suitable for offshore environments. The VDX05EX visibility meter is used to control the foghorns and marine lights, when the visibility is changing because of changing weather circumstances.